1. In stable patients, who otherwise do not require the OR, ultrasound may be as specific as local wound exploration in predicting need for laparotomy following anterior stab wounds. 2. Ultrasound is not sensitive enough to rule out the need for laparotomy in these patients. Here's the deal: if you get stabbed in the abdomen - it matters how deep the knife goes. If it goes into the peritoneum, that = bad. These patients will get an exploratory laparotomy to see if any bowel or organs were damaged. However, about 25% of abdominal stab wound are superficial. These wounds are unlikely to benefit from a laparotomy. We don't want to subject them to the risks of surgery without benefit, so we want to avoid bringing these patients to the operating room (OR) without missing any stab wounds that are deep. Here are the options in determining if the peritoneum was violated - diagnostic peritoneal lavage (rarely used), CT (may not be sensitive for certain injuries), local wound exploration (commonly employed for this purpose), or serial clinical exams. Ultrasound is being offered up here as a potential alternative that is fast, noninvasive, and could potentially help with decision making. 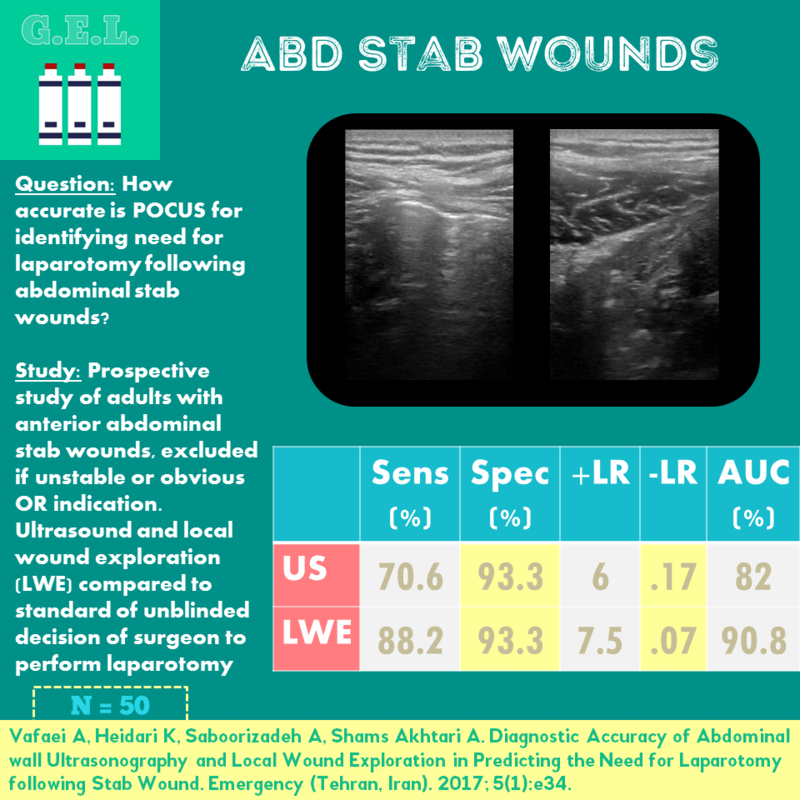 Can POCUS accurately diagnose the need for laparotomy in patients with anterior abdominal stab wounds? All patients received ultrasound and local wound exploration. Both of these methods was compared to decision made by the “in charge surgeon” of whether or not to perform laparotomy. It is unclear if the surgeons were blinded to ultrasound, but it seems they were not blinded to the wound exploration. Test characteristics were calculated for both ultrasound and local wound exploration. Main problem here is that the outcome was predicting laparotomy. This is a good patient centered outcome BUT there are a lot of factors that may play into the decision that are not controlled for in this study. The surgeons likely trusted the local wound exploration (which is understandable) and since there was no blinding to this, it may have influenced their decision and made the LWE appear more accurate compared to ultrasound. When you are using ultrasound not necessarily to diagnose but to predict a complex decision - it becomes difficult to use the data clinically. This study does not actually tell us how accurate ultrasound is in determine peritoneal penetration, it only tells us that people with a positive ultrasound are more likely to get laparotomy (which could due to any number of confounders). Most cases were knife inflicted - unclear how accurate in gunshot wounds (where path can be even less predictable) or other penetrating trauma. 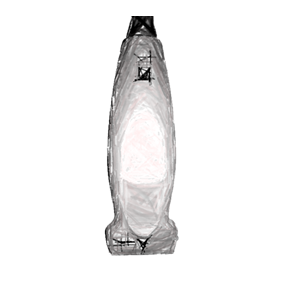 Only performed 10 x 10 cm area around wound - may have improved sensitivity if used larger area. Confidence intervals were fairly large. Likely would require extra training since this is not standard focused exam. 2. Ultrasound is not sensitive enough to rule out peritoneal penetration in these patients.